If you're on a quest for a complete 'time out', this tea tasting is perfect for you! Fragrant, aromatic teas and a fascinating tea ceremony. This class is by reservation only. Please drop us an email. A real treat. 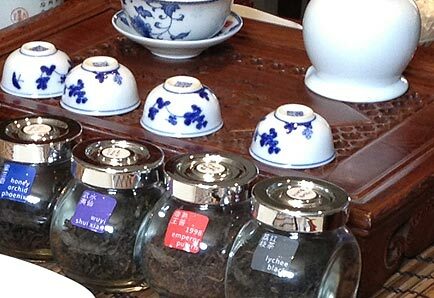 Sample some amazingly different teas, each in its own way fascinating, fragrant and delicious. Our tea master will share his enthusiasm and encyclopaedic knowledge, while you marvel at the natural sweetness, taste and aromas that you never guessed existed. Our ‘Flight of Tasting’ Event lasts 1 hour and costs £25 (includes a selection of our gorgeous, fresh tea patisserie). It is held on selected Saturdays at 10.45am. We reserve the right to impose a quorum of two participants for each class.